I found it surprisingly difficult to find just the right small-scale tank treads I wanted for Isabell’s robot, so naturally I looked into brewing-my-own. I first went down the RTV silicone path, but soon reeled it back to reality… I want to get this off the ground soon, then maybe look into full custom treads for the next generation. So the following is an experiment, sort of a feasibility test for 3D-printed tank treads. This is really my first pass at a “tooth” design in CAD, based on nothing really. The cog teeth are simply arc sections meant to make the lead-in and lead-out smooth, and the tread profile is a rough approximation of the cog teeth. 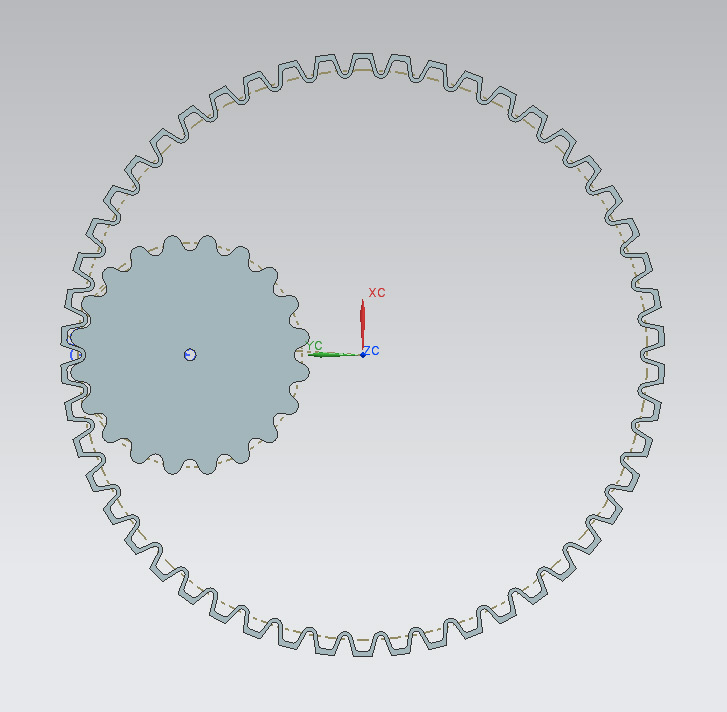 This is the result, using an FDM tread on a laser-cut acrylic wheel assembly. I actually made three different sized sets of wheels and picked the best fit, then measured and cut the rectangular parts to provide a decent pre-load on the tread. The whole thing is held together precariously with a couple of dowel pins (and comes apart quite easily). I had some concerns and they were mostly justified… The tread slips off the wheels easily after playing with the assembly for a couple of minutes, but that could be fixed with some retaining features. Also I suspected the tread would take a ‘set’ after sitting still for a couple of days– a function of the creep properties of ABS. Sure enough, a few days later I took the tread off and it had an elliptical shape, which I could feel in the form of on-again-off-again resistance when rolling the assembly along. I’ll bet a thinner-walled tread would be less prone to taking a set but still be strong enough to survive all the deformation. Ultimately I think the idea is feasible, but an RTV-cast silicone part would be my first choice for many reasons. 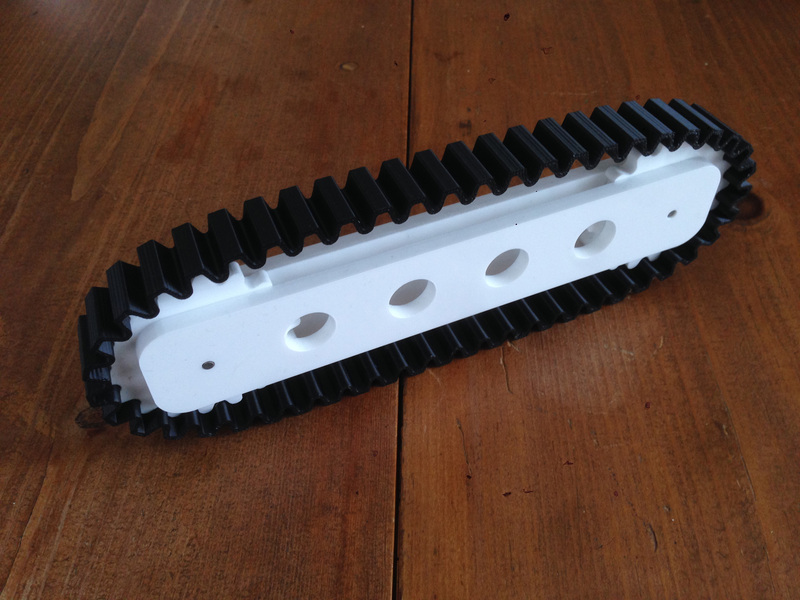 The entry 'My First Robot part 2 – 3d-printed tank treads' was posted on April 22nd, 2014 at 5:14 pm	and is filed under robots. You can follow any responses to this entry through the RSS 2.0 feed. Both comments and pings are currently closed.